Join us on Earth Day, April 20th, at a SOLVE clean-up site and help us keep Oregon clean and healthy. September 5st, 2018. River City Environmental announced today that it will host a celebration marking the completion of their neighborhood’s Local Improvement District’s (LID) infrastructure and stormwater facility upgrades. 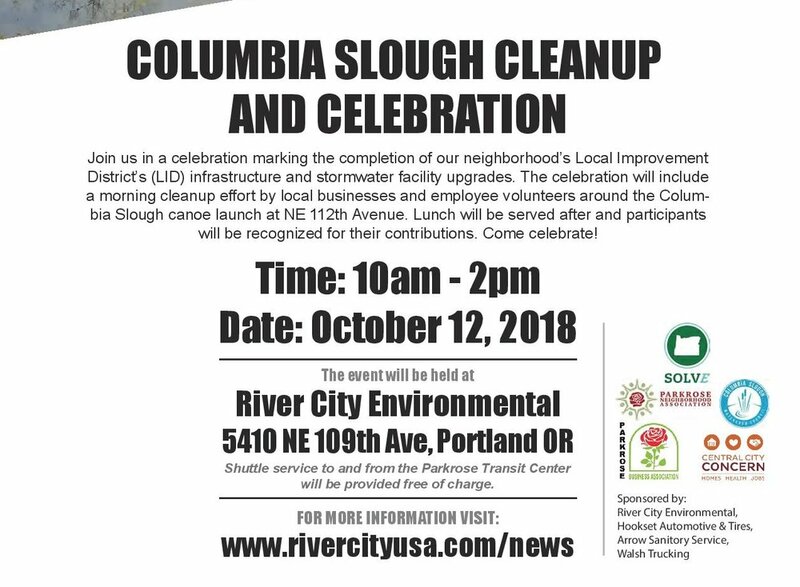 The celebration will include a morning cleanup effort by local businesses and employee volunteers around the Columbia Slough canoe launch at NE 112th Avenue. The event will then move to River City’s facility where lunch will be served and participants will be recognized for their contributions. Notable luncheon highlights will include speaker presentations by River City’s Owner, Steve McInnis and other participating business, City of Portland and non-profit organization leaders. The event will be held on Friday, October 12th from 10:00 AM to 2:00 PM at River City Environmental: 5410 NE 109th Ave, Portland, OR 97220. “The businesses in our area hope that this celebration demonstrates our appreciation for the great work the Portland Bureau of Transportation has done in getting these upgrades completed in such a timely and efficient manner,” said River City’s Steve McInnis, “The pavement, lighting, landscaping and stormwater improvements realized as a result of this effort have vastly improved safety, access, customer confidence and business operations for all businesses concerned,” added McInnis. Morning cleanup efforts will be held from 10:00 AM until noon. Clean-up participants will stage at River City’s facilities in the morning. The luncheon celebration will be held from noon until 2:00 PM. Shuttle service to and from the Parkrose Transit Center will be provided free of charge during the event. A limited number of volunteer positions will be available for the general public. Details are available on the River City Environmental and SOLVE websites. Luncheon features will include informational presentations and exhibits from SOLVE, The Parkrose Business Association, Central City Concern, Columbia Slough Watershed Council, Historic Parkrose, the Parkrose Neighborhood Association, and Street Roots. Portland’s Local Improvement District (LID) improvement projects are primarily funded by property owners in partnership with the Portland Bureau of Transportation (PBOT). The NE 112th & Marx LID was able to redirect budgeted Bureau of Environmental Services funds to build a far more robust stormwater management system while also defraying costs of the LID for property owners. The Portland Water Bureau also took advantage of the opportunity to replace an undersized water main in NE 112th Avenue while the street was being reconstructed. For more information about PBOT, their participation in this event or LID efforts in your area, please contact PBOT at 1120 SW 5th Ave., Suite #800, Portland, OR 97204 or call Andrew Aebi at 503-823-5648. For information on BES’ Columbia Watershed Stewardship Program (CWSP), please contact Jennifer Devlin at: 503-823-1234.